Oh Luscious Lush: What’s On My Lush Wishlist?! If I’m being completely honest with you guys I have to say that the last couple of years I wasn’t that crazy about Lush anymore. I don’t really know why because I do like their products a lot. The only reason I can come up with is that the store is always so crowded and I can’t deal with crowded places. However, a while ago I did go into a Lush store and actually bought a product. This awakened my love for Lush all over again. It actually resulted in me coming up with an entire Lush wishlist. So, to celebrate the fact that I’m back into Lush I decided it might be fun to share this wishlist with you guys. It won’t be a crazy long one, but all are product I’d actually buy and maybe will actually buy in this upcoming week. Who knows…. Anyway, if you’re interested in seeing what’s on my wishlist, make sure you continue reading! The very first thing on my wishlist is the Butter Bear Bath Bomb. I saw this last time I was at Lush and I loved the scent of it, but somehow I didn’t pick it up back then. I do regret that because I think it’s super incredible. 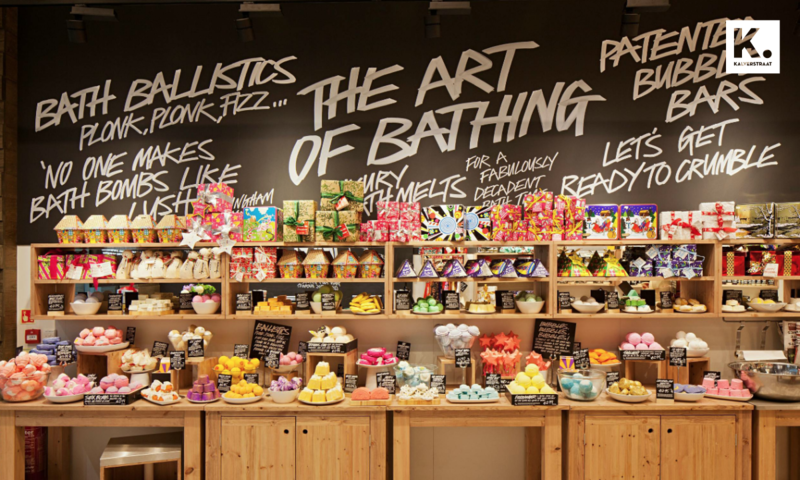 I love the look of it and bath bombs in general are just so cool. I like that you can just cut off a bit of this and use it in parts, since I always think it’s a big waste to use a bath bomb all at once. If I were to be rich I’d definitely love to do that, but being a broke student I don’t think that’s the lifestyle for me. Another product that is very high up my wishlist is the Candy Cane Bubble Bar. Bubble Bars are also re-useable and this one looks so super cute. I love, love, love it. It has a citrussy scent which I think is okay. I would’ve loved a peppermint scent better but maybe that would be a bit too cooling on my lady-parts when I’m taking a bath with that. The third product on my wishlist is the Star Light Star Bright Bath Melt. I’ve never used a bath melt but it sounds like a really nice and relaxing product. It is a very shimmery one so I figure you will be left with a glittery body but hey, I don’t hate the idea of that! Something that has been on my Lush wishlist for forever is one of their lip scrubs. They do have a Christmas one I believe and well, that’s extra special so that’s the one that I want. They used to have a red one but this year I could only find a purply pink coloured one in this holiday collection, but that’s cool too. I don’t know how often I’d use it, but I know I’d love to get a little lip scrubby. They are so cute! Next up on my wishlist is this really pretty Cheery Christmas Bath Bomb. It’s a really pretty pink bomb with a white snowflake in the middle. I think that it looks really, really pretty and I’m sure it will smell absolutely incredible. I’d love to see what my bath looks like after using this! Moving on to the Shooting For The Stars Bath Bomb. This might be the most exciting one yet. I heard that this one looks really, really amazing in your bath. It might even be one that I’d use all at once to get that really cool effect. Who knows?! Even though I’m really excited about the Shooting For The Stars Bomb, this last item is the one I want the most. It’s the famous Magic Wand Bubble Bar. This is reusable like all of the bubble bars and it just looks so super pretty. I need this in my life! With that being said I think I’ve mentioned pretty much everything I really want to get from Lush. I might stop by a Lush store soon and pick some of the products up. If I do, I’d definitely let you know. Anyway, thank you guys so much for reading today’s post, and be sure to let me know which Lush products you’d recommend! Butter bear heb ik vorig jaar gehad en die vond ik heel fijn! Niet heel speciaal met kleurtjes, maar echt lekker voor de ontspanning. Die candy cane lijkt me ook heel fijn!